Hunger is sometimes called the silent crisis. Silent crises are the ones that are overlooked, crowded off the front pages by late-breaking news. Years of experience tell us that when hungry people are silent, they go unnoticed by the rest of the world. Apparently, to become a real and present crisis, those of us with full bellies need to be shaken awake. In 2007-08, the world was roused to the plight of hungry people by street riots protesting skyrocketing food prices in some forty countries. And there is reason to believe that rising food prices have also been a factor in the uprisings that have spread across the Middle East. The food riots of 2007-08 prompted the world to focus attention on agriculture in a way that it had not done for twenty-five years or more. So, when hungry people and their supporters stop being silent, things happen. As the U.S. budget stalemate persists, concerned U.S. leaders and advocates are breaking the silence of hungry people by themselves going hungry. They are trying to ensure that cutting programs that support poor and hungry people around the world is not the easy and uncontested way to balance the budget. Who are these poor and hungry people? The cruel irony is that small-scale farmers account for half the world’s undernourished people and the majority of those living in absolute poverty and in marginal ecosystems. And at the same time, in a world that needs to increase food production by 70 percent by 2050 while dramatically reducing greenhouse gas emissions, these small-scale farmers represent a vast, undertapped potential. When the President of the International Fund for Agricultural Development (IFAD), Kanayo Nwanze, took office in 2009, the first message he sounded to the world was a plain and unvarnished one: “Poverty and hunger are inhuman and cannot be tolerated.” While holding to that truth, he has since added another: “Every farm, no matter how small, is a business.” This focus on the business dimensions of agriculture and food production recognizes the critical importance of dynamic agricultural markets for sustainably overcoming rural poverty and hunger. IFAD’s business is investing in projects that enable small-scale farmers to ensure adequate food for their families and increase their income. Targeted investments in gravity-piped water facilities and wells in dryland communities in Ghana, for example, mean that women like Elizabeth Wanjiru, who lives in the Kiambu District, can now fetch in two minutes the clean water that used to take six hours each day to fetch. With more time and training in improved farming practices, Elizabeth has moved from subsistence production to a profitable and more environmentally sustainable enterprise. This kind of investment in self-reliance resonates deeply with American culture and ethics. 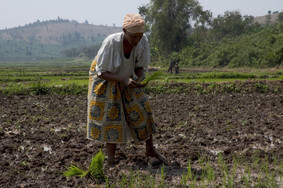 Since its founding more than thirty years ago, IFAD has reached some 300 million poor producers like Elizabeth Wanjiru. And, with the encouragement of member states and contributors like the US, IFAD has been achieving steadily greater impact with each dollar it invests. It’s time we better understood how intimately our future is linked with that of poor rural people the world over. Investments today in enterprising, small-scale farmers will pay dividends for generations.